I stumbled upon this amazing Ted Talk, about representation in media (in this case fiction writing) which I actually posted earlier this week, but I thought I would post it again in case you missed it. I can’t recommend highly enough the presentation that she gives. It is both powerful and also has some pretty funny moments too. You may also recognize her, since Beyoncé sampled one of her speeches in her track Flawless. Born in the city of Enugu, she grew up the fifth of six children in an Igbo family in the university town of Nsukka in Nigeria, home to the University of Nigeria. While she was growing up, her father James Nwoye Adichie was a professor of statistics at the university, and her mother Grace Ifeoma was the university’s first female registrar. Adichie studied medicine and pharmacy at the University of Nigeria for a year and a half. During this period, she edited The Compass, a magazine run by the university’s Catholic medical students. At the age of 19, Adichie left Nigeria and moved to the United States for college. After graduating she decided to pursue a master’s degree in creative writing at John Hopkins University, and later in 2008 she also received a master’s degree in African studies from Yale. 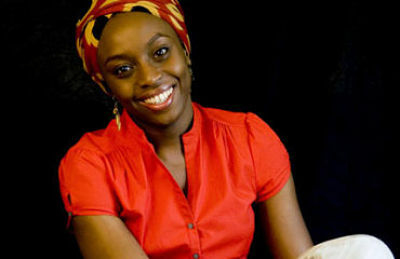 Adichie published her first work (a collection of poems) in 1997, but it was in 2003 when she published Purple Hibiscus that she received wide critical acclaim. She has been writing and publishing steadily for the past ten years, and continues to give lectures such as the Ted Talk presentation linked above. Her works showcase Nigeria, and her experiences growing up there. Purple Hibiscus begins like many novels set in regions considered exotic by the western reader: the politics, climate, social customs, and even the food, unfold like the purple hibiscus of the title, rare and fascinating. But within a few pages, these details, however vividly rendered, melt into the background of a larger, more compelling story of a joyless family. I think this is the most important aspect about her work, she is able to take a place that is for many people far away and strange and makes it accessibly and familiar to readers all over the world. I am looking forward to following more about this lovely lady and her works. If you are interested her awards and nominations for her writing can be found here.